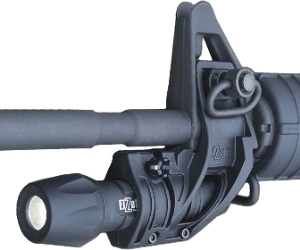 The Elzetta ZSS1500 provides a Quick Disconnect (QD) Heavy-Duty Sling Swivel which may be installed on either side of the Elzetta ZFH1500 Tactical Light Mount. The perfect accessory for those wanting to use a side mounted sling with their Elzetta ZFH1500 Flashlight Holder. Improving on the military M4 front sight base side sling, the ZSS1500 kit adds the convenience and speed of a quick disconnect heavy duty sling swivel. The Swivel Attachment is made from Type III hard anodized 6061-T6 aluminum and allows full 360-degree rotation of the Swivel. The QD Sling Swivel is manganese phosphate coated steel. Mounting hardware included. Like all Elzetta products, the ZSS1500 is Made in the USA.